My heart started to beat faster. Our boat rounded the bend in the Sundays River when suddenly a surreal landscape appeared. 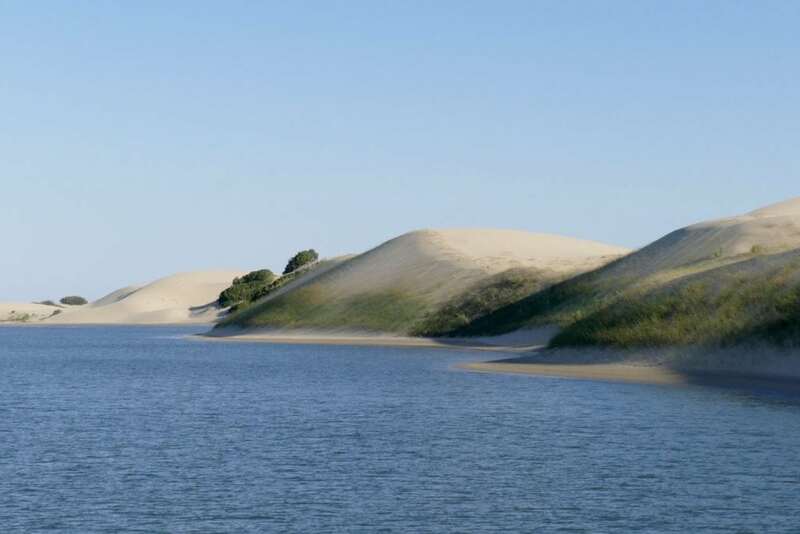 Sand dunes that stretched from the river all the way to the sea, miles away. 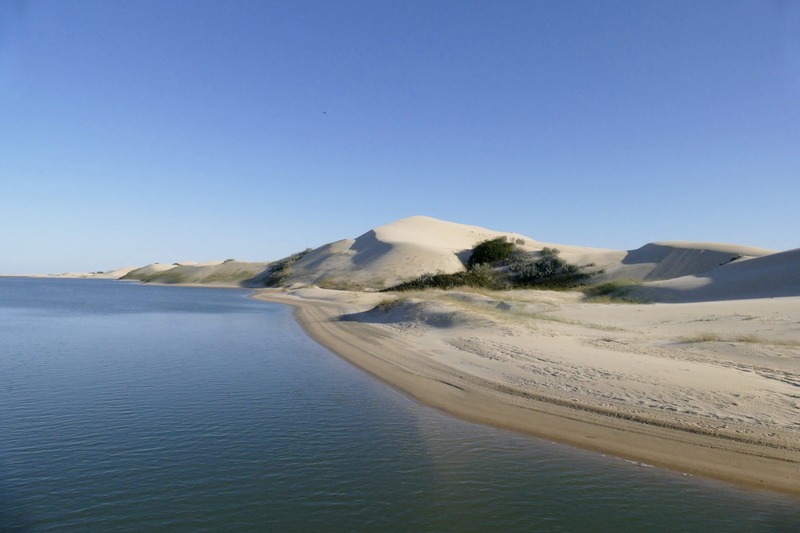 This could have easily been a Namibian desert, or the set of the next Star Wars movie. There was silence all around us, with only some birds flying by and the occasional slapping sound of a fisherman’s net hitting the water. But this was neither a desert nor a movie set. 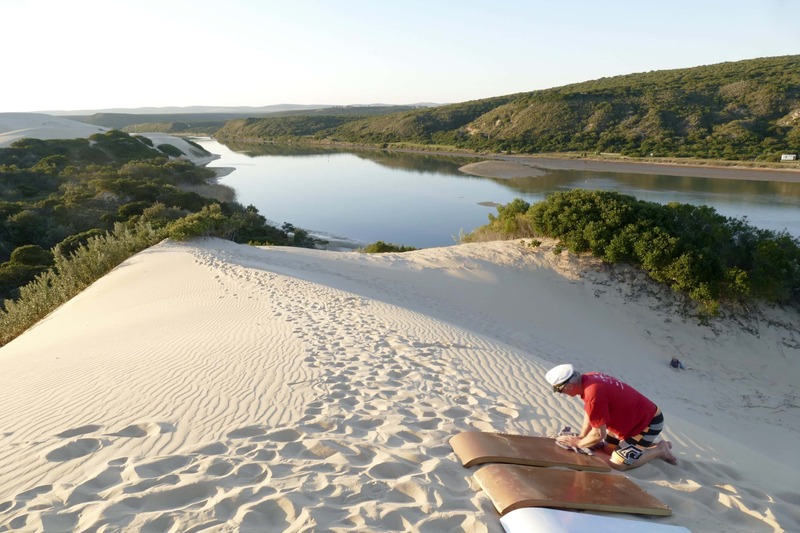 This is the place where our family enjoyed a fun experience in a bizarre environment: sand sliding! Sand dunes are indeed one of South Africa’s lesser known attractions. 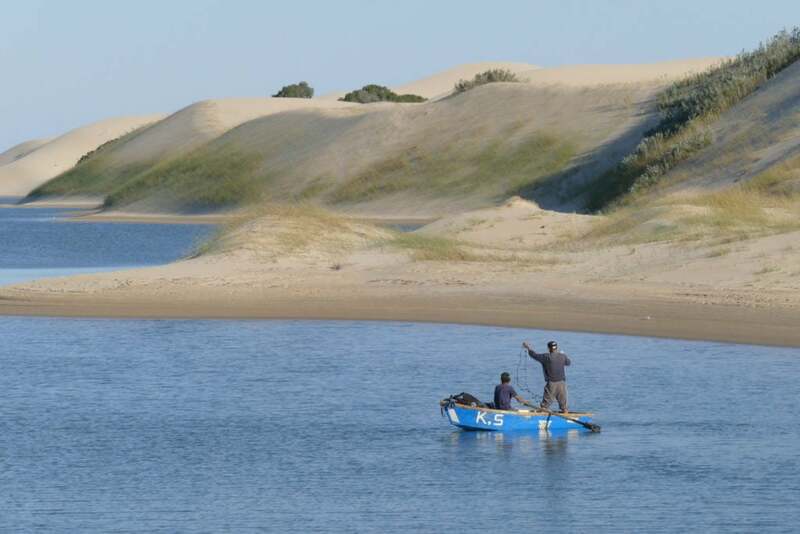 But the Alexandria dune fields in Colchester (near Addo) are actually part of the largest coastal dune field in the southern hemisphere. 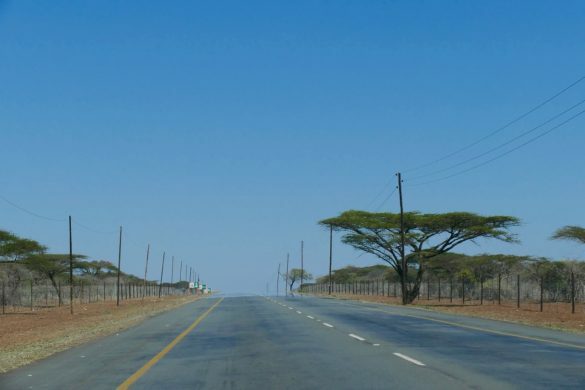 It stretches for 50km and is 2.2 km wide on average. 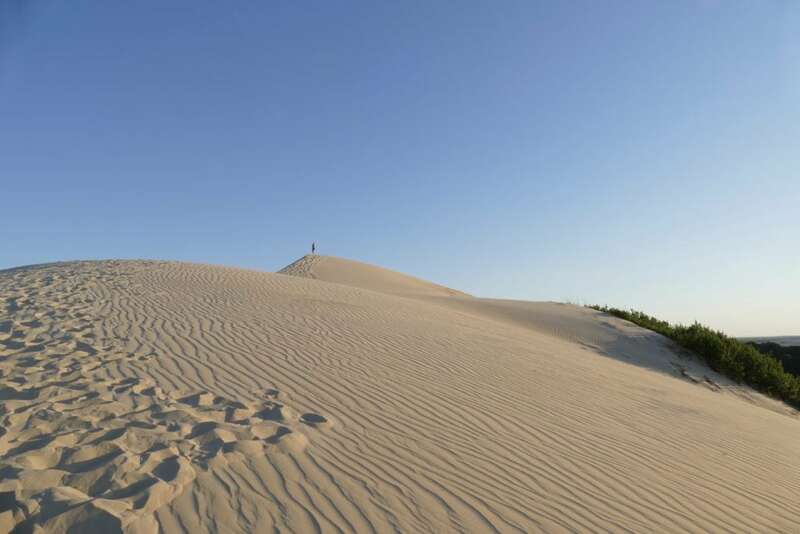 You can move from sea-level right up to 140m high dunes. These dunes were formed over 10,000 years ago when sea levels were much higher. 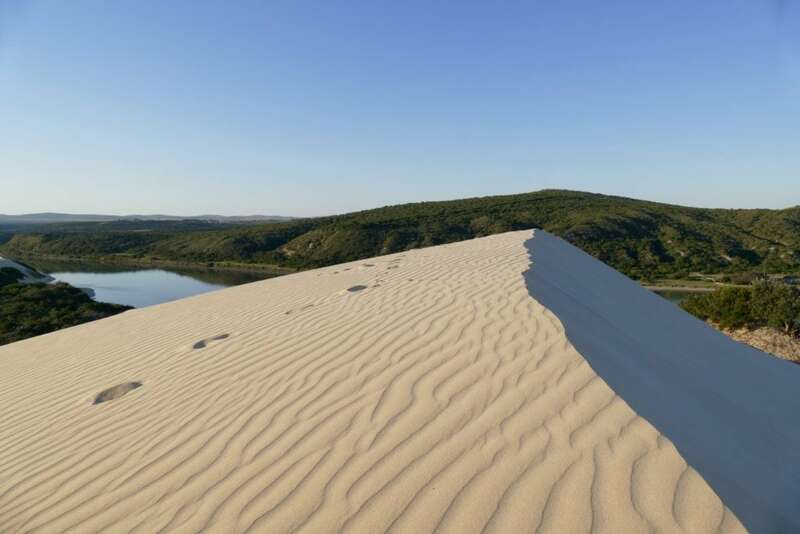 Not just your average dune field I can tell you! 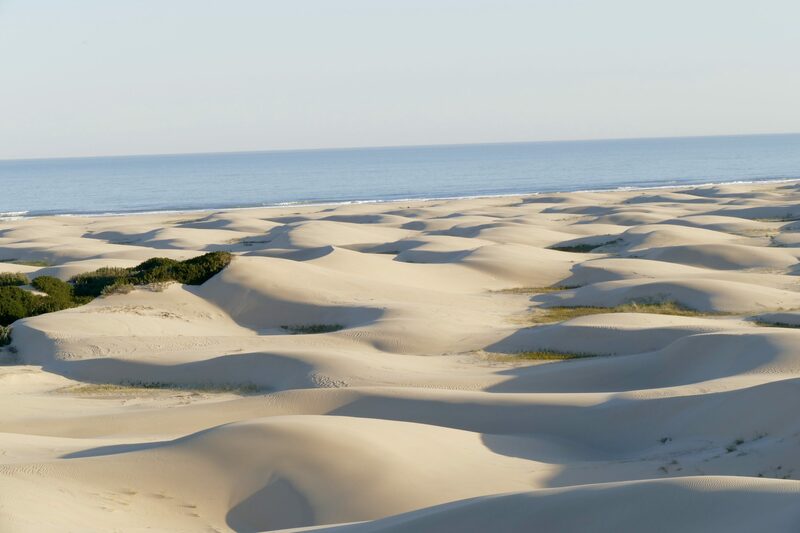 The dune fields are part of a reserve and privately owned so freely entering the area is not possible. But you can book various trips. Go hiking, cruising, or stay in a lodge close by. 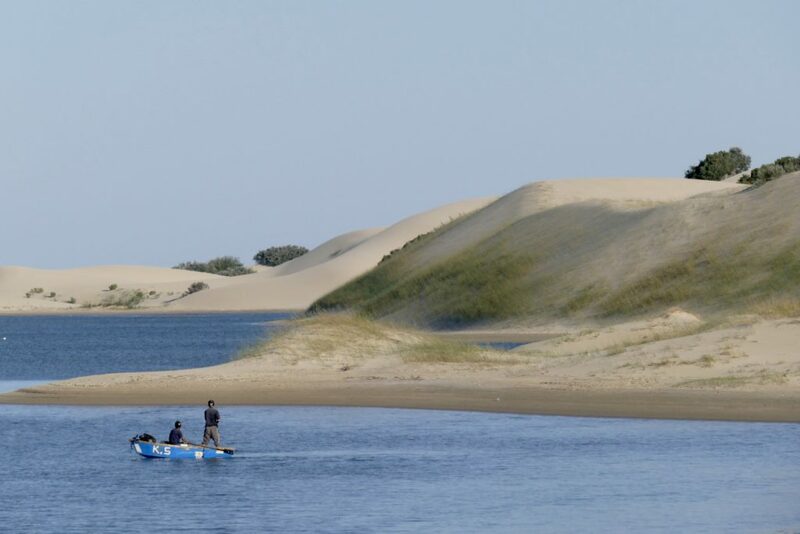 We have seen only a very small part of the area, because our main target was to slide down the dunes on a wooden board: Sand Sliding! Captain Les of the Sundays River Ferry Company brought us from the village of Colchester to the sand dunes. It took us 30-45 minutes by boat to get there. We enjoyed lots of bird life and had a great chat with our sand sliding travel companions. 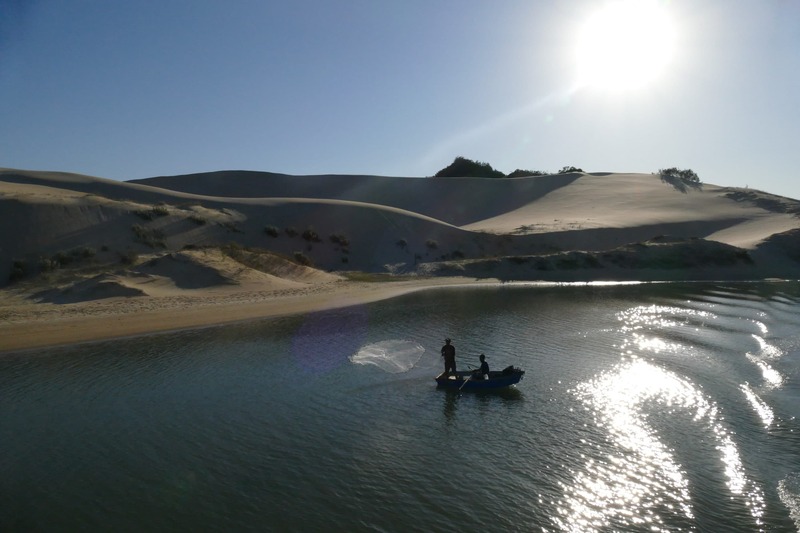 Chatting about our trip so far and how we would enjoy sand sliding, it suddenly went silent. 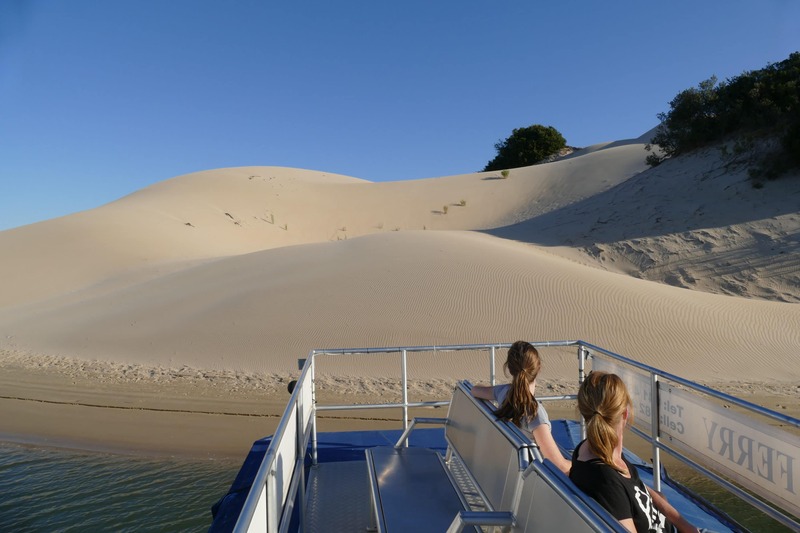 Our boat rounded the bend and we were faced with one of the most impressive sites of our South Africa trip: the Alexandria dune fields. 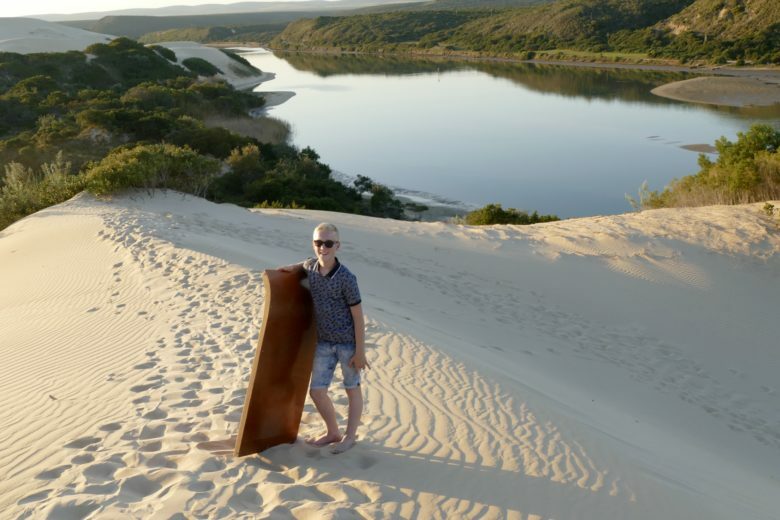 What is sand sliding? 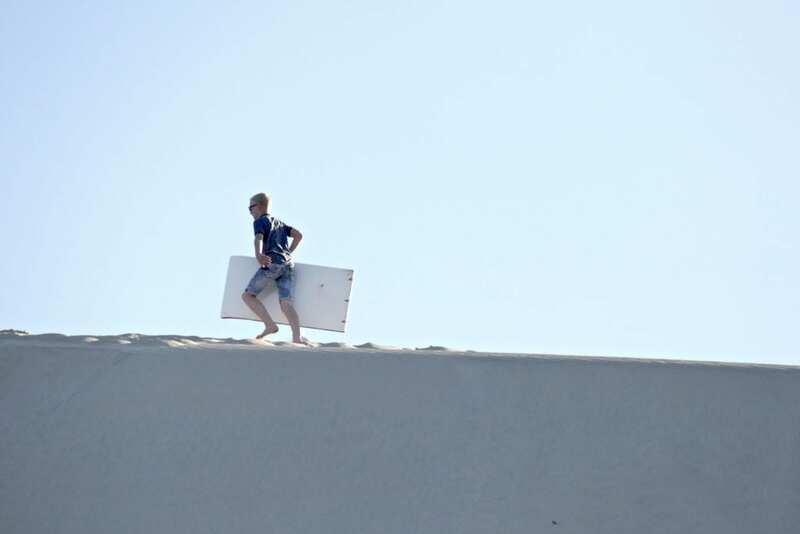 Well, you take a wooden board and a sand dune. Stand or sit on the board and off you go downhill. It’s a bit like snowboarding but the way down is way shorter and you don’t have to dress for the cold…. Big difference though is the fact (fact!) 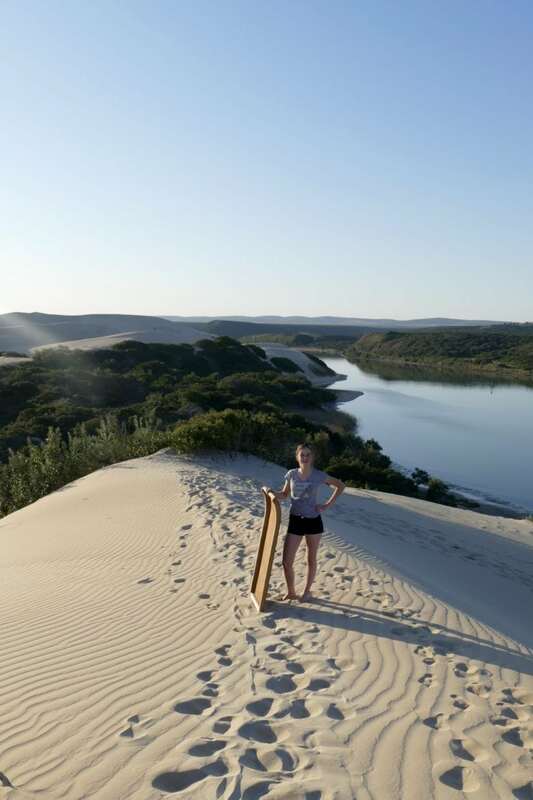 that after your sliding trip you have sand everywhere: in your clothes, hair, eyes, mouth, everywhere. 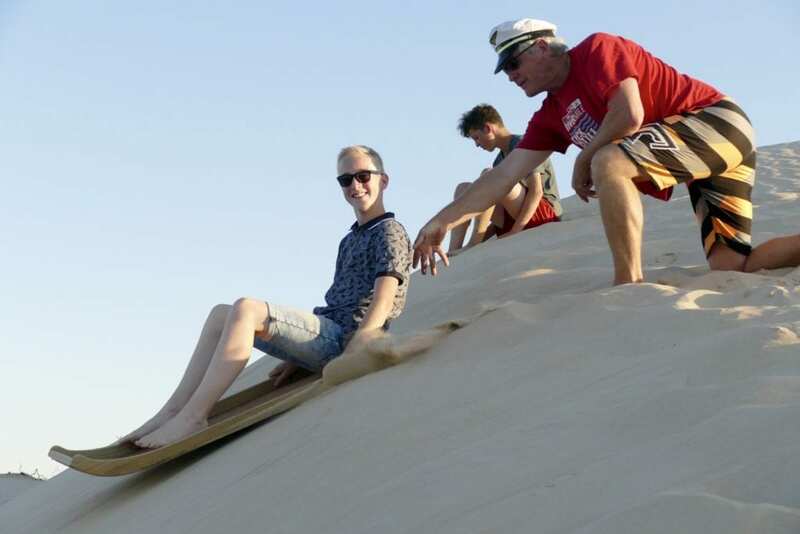 Think off a place and yes, there will be sand after your sand sliding experience. 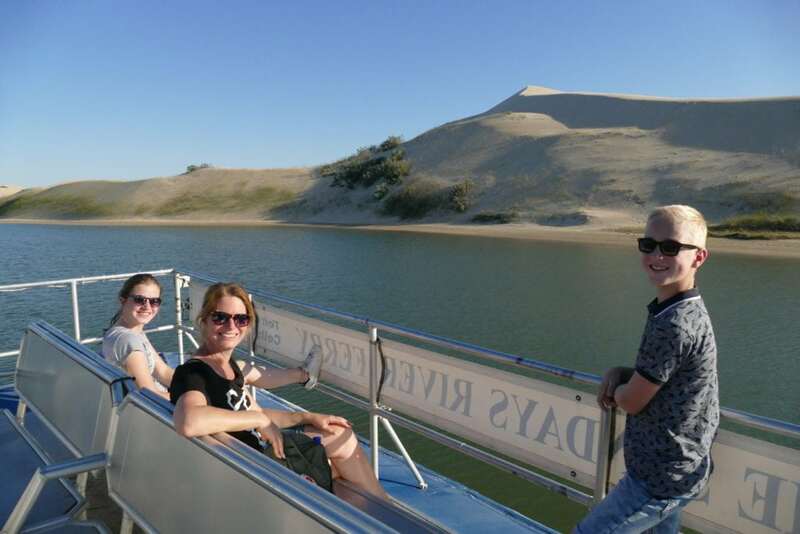 Enthusiastically we jumped off the boat to start our sand sliding adventure. Each of us took a board and we walked up hill… that was a tough nut to crack I can tell you. Walking in loose sand is strenuous. Some of us made it up and down the hill only twice. You really get exhausted climbing up that hill, carrying a board. Our kids went down like five times, where I finished 3 rounds. But it’s so much fun!! First Captain Les explained about the dune fields and we collectively enjoyed the beautiful view. After his introduction we started waxing the boards. Wax on, wax off. Yes, I felt like Karate Kid. And after that final preparation work we went downhill! Woohoooooo….. 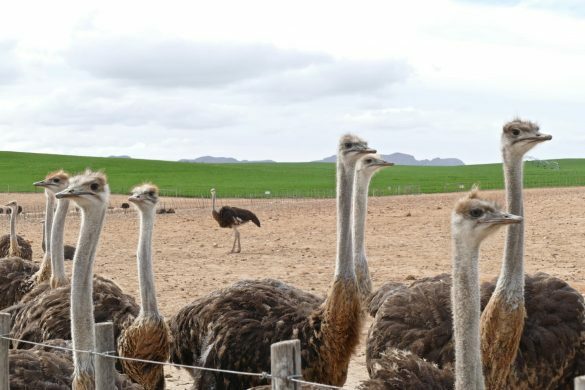 The beauty of Mother Nature goes beyond your imagination when you travel in South Africa. 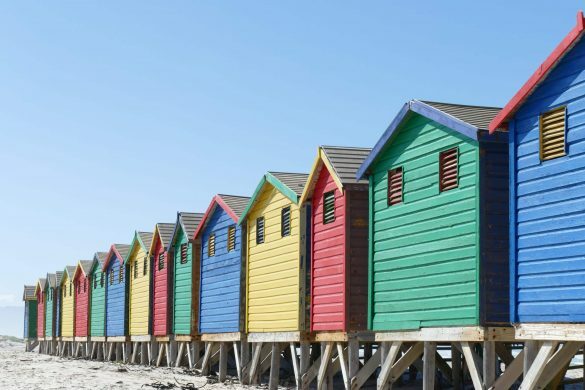 The Western Cape, the Garden Route, the semi-desert region of Karoo, the Panorama route and all the National Parks, to name just a few. These dune fields are the first of many great places that will be featured on this blog. More in upcoming blog and photography posts, so stay tuned! 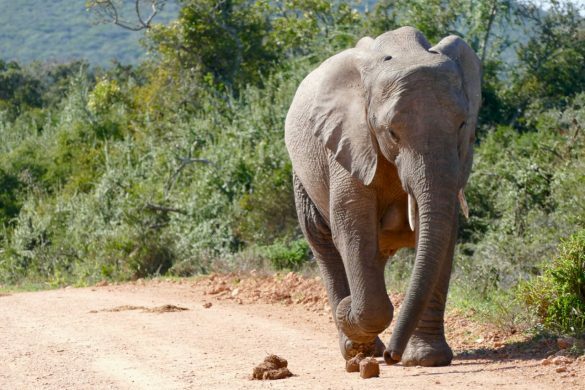 Don’t miss the earlier blogposts about South Africa: Our South Africa itinerary (and where to stay), and Best safari near Kruger Park. Wat gaaf! 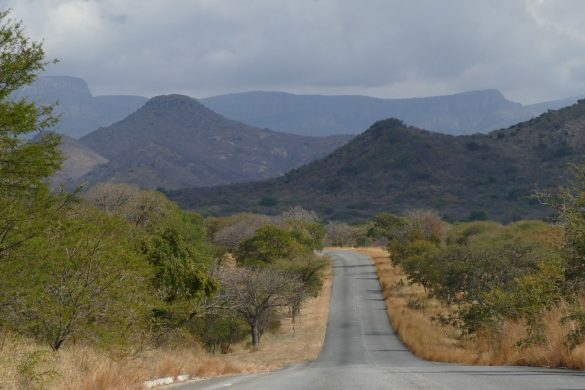 Deze gaat zeker op de planning voor als ik in oktober naar Zuid-Afrika ga. There were hardly any people around indeed.. which is always good news 🙂 Thanks Bama. 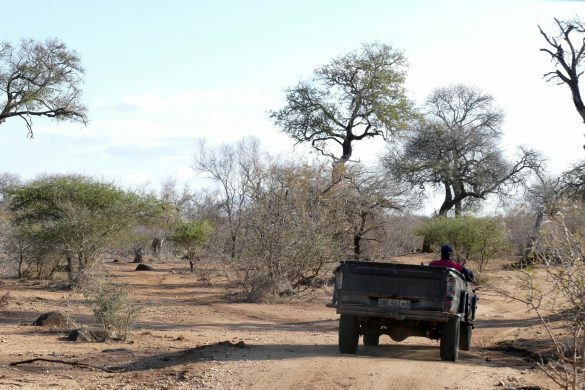 We also didn’t know much about this place as we actually kind of stumbled upon it when we arrived at our lodge near Addo. We were lucky! 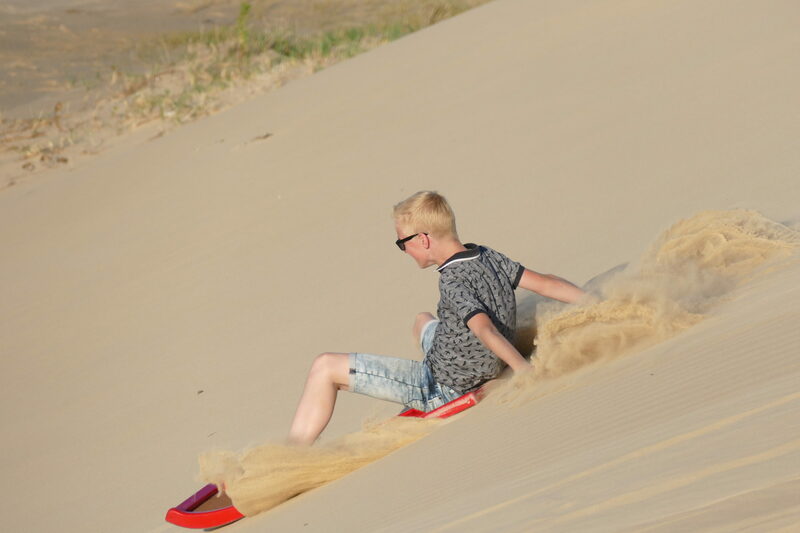 I loved sand sliding too!! I did it in Vietnam near Mui Ne. I hadn’t heard of this place! Looks great!